Mohammed Hessad, 33, left school at the age of 14 to help his mother pay the household expenses after his father passed away. Upon his father’s death, Mr Hessad knew he had to do something for his family to survive. “At a very young age I learned how to be an adult for the sake of my family. I have no regrets. I started go­ing fishing by using other people’s boat,” Mr Hessad said. But he knew that practice could not carry on. 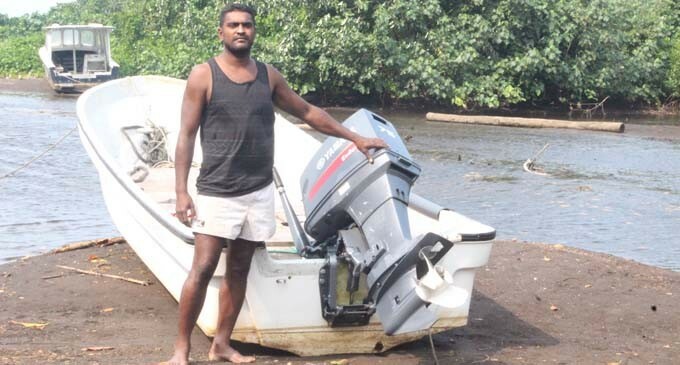 He want­ed his own boat and outboard motor. It was important for him to help himself as life at Dala Settlement, Navakacoa, near Qeleni was getting more dif­ficult by the day. He went around asking per­tinent questions among peo­ple he knew could help him. It was in 2012 when Mr Hes­sad ended up at the door of the Northern Development Programme (NDP) office in Labasa. The NDP is responsible for processing loan applications specifically for people from the Northern Disivion. “I received $7110 (from NDP) and loaned $8190 from a bank. I was able to buy a boat and engine. I can get $700-800 in one catch when it is a good catch,” Mr Hessad said. “I was able to pay off my loan and bought another boat and engine. “The main challenge we face is weather. Mr Hessad is married to a local iTaukei woman and they have three sons who are in Year 1, Year 4 and Year 6 respectively. Mr Hessad considers him­self prudent when it comes to spending his earnings from fishing. “I also built my house through the money I get from fishing,” he said. He urges students to work hard because now the Gov­ernment has lifted the par­ents’ burdens by providing free school fees and bus fare. “I had to work hard and the struggle was real. Through my hard work I reached this far. “It was not easy but I was able to overcome challenges,” Mr Hessad said.